About two weeks ago I put "purchase cuticle remover" on my to do list because I really needed it. I ended up getting the Sally Hansen problem cuticle remover for $4.50. It comes with a 1oz turb of aloe vera infused cutlce remover cream and two cuticle sticks. You are supposed to run the cream over your nails for 3-5 minutes and then wipe the product off of your nails. I wouldnt say that it literally removed the scraggly cuticles, rather it make it manageable and soft enough to be easily pushed back by the cuticle sticks. 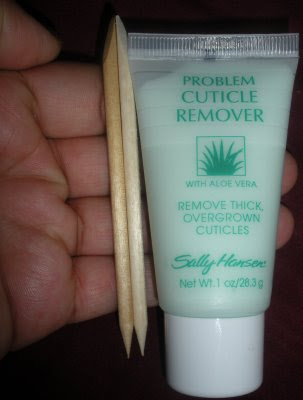 If you know of a great cuticle remover, please let me know. Has anyone out there created a natural cuticle remover? I am looking forward to the movie American Violet, based on a true story. The movie will open on April 7th. We saw the preview for American Violet online last night and declared it a must see! I used to have that cuticle cream a long time ago, don't know what happened to it. I am obsessed with giving myself a at-home mani so cuticle removers are a must for me. I have one by Sally Hansen. It's a green gel and works pretty well! wow, you stay up on some movies. i might have to check that out. i like supporting black films. as far as the cuticle remover, let me know if you find a good one for a decent price. Hmmm... I'd give this a try for the push back. I don't cut mine but just push them back. Thanks. Hi Antithesis yes, I like to know what's out there in the movie world. Certainly if I find something better I will post on it. I have that too and I'm not sure what to think of it. I suppose it would be unhealthy for a company to sell a product that scrapes off cuticles over the counter, so the fact that this softens cuticles is good enough, I suppose.